A 66-year-old school teacher who was injured in the April 7 terror truck attack in Stockholm has died, raising the death toll to five. Mother-of-two and grandmother-of-one Marie Kide had been receiving treatment at Karolinska University Hospital for three weeks. She was a victim of 39-year-old Uzbek national Rakhmat Akilov's terror attack after he rammed a truck into a crowd on a main pedestrian shopping street in the Swedish capital. 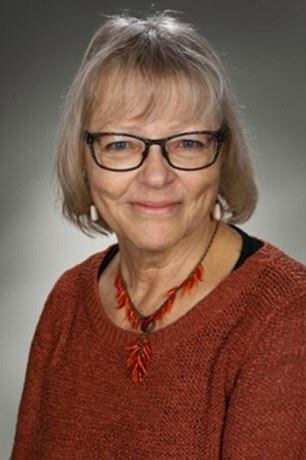 Tribute has been paid to the widow, who lived near Gothenburg in Trollhättan, with her Green Party colleagues saying Ms Kide has 'left a big gap'. Esther O'Hara, local leader of the party where Ms Kide was a member, added: 'It is with great sadness that we have received the message that our beloved companion and colleague Marie Kide has disappeared after being hurt very seriously during the terrorist attack in Stockholm on April 7. 'Marie has left a big gap after herself, she was a woman with a big heart and moral courage. 'Marie, who was also the member of the Green Party in Trollhättan's Education Board, always stood up for the children, and for those exposed to problems in society. Police have not disclosed a motive for the attack and no extremist group has claimed responsibility for it. Akilov's Swedish residency application was rejected last year but police said there was nothing to indicate he might plan an attack. After the rejection, Akilov had been been ordered to leave Sweden in December. Instead, he allegedly went underground, eluding authorities' attempts to track him down. Akilov was caught in a northern suburb of Stockholm, hours after he drove the stolen beer truck into the crowd of afternoon shoppers outside the upmarket Ahlens store. Other victims of attack were an 11-year-old Swedish girl, a 31-year-old Belgian woman, a 69-year-old Swedish woman, and a 41-year-old Briton whom the British government identified as Chris Bevington. Fourteen others were injured in the attack. The attack had shocked Sweden, known for its welcoming policy toward migrants and refugees. In 2015, a record 163,000 asylum-seekers arrived in the country - the highest per-capita rate in Europe. The government responded by tightening border controls and curtailing some immigrant rights.